When you pick up the autobiography of a race car driver, you’re expecting a description of a career, a life. You’re probably not picturing a brief account of five short years out of a decades-long career, riddled with mental and physical health. But with Dale Earnhardt Jr.’s autobiography, that’s exactly what you’re going to get. The first thing I noticed when I picked up Racing to the Finish was its size. I’ll be honest: I’m a serial book review reader. With about seventeen books to read in the span of four months for school, I need to make sure a book actually sounds good before I read something I’m not going to be graded for. But I stayed away from reviews of Junior’s book—I just portioned off two weeks for me to dive into what I was sure was going to be a lengthy, detailed account of his life and racing career. It’s pretty safe to say that I was not expecting to find a novel under 200 pages that I could easily knock out in about half a day. See, this is less an autobiography of a man or a career than it is of a health struggle. 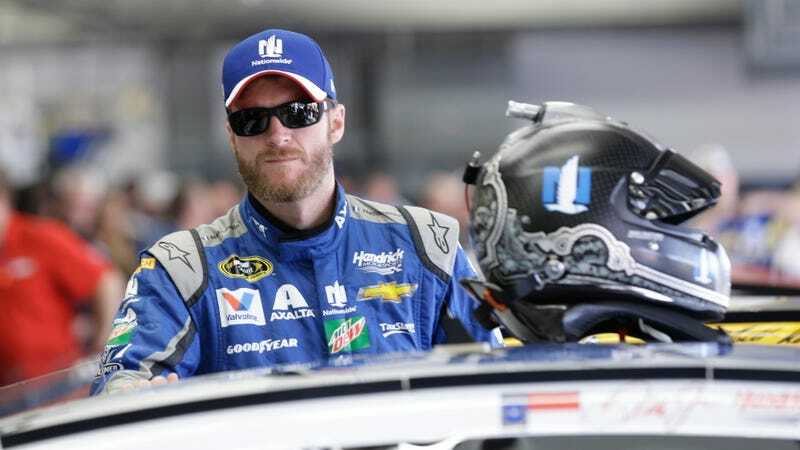 It’s becoming pretty obvious that Earnhardt Jr. was suffering from some pretty gnarly concussion symptoms during the past few years, but the true extent of it has been kept out of the media. Now that Dale is retired, he saw his opportunity to talk about what was really happening. This book is, in a word, fascinating. Junior’s writing is conversational and easy to read. It’s like he’s sitting down with you over a beer while you skim through the pages. And this bad boy is a real page turner—I can’t speak for long-time Earnhardt fans, but I’d be willing to bet that even they learned something new in the pages of this autobiography. See, instead of focusing on his great successes or lowest moments, Earnhardt highlights an aspect of sport that is largely misunderstood: concussions. As he mentions in his book, Dale has been suffering from bad concussion symptoms on and off since a testing accident in 2012. He masked his symptoms for the most part and only sought out help when he felt unfit to get behind the wheel. It’s an incredibly enlightening book. Even today, in a world of social media, it’s pretty tempting to look at race car drivers as being invincible gladiators, unaffected by even the most daunting of accidents. Earnhardt goes out of his way to describe all those wild heroes from back in the day: the men who drove with broken bones, with their eyes taped open against swelling. Even though we know more about the impact of racing injuries, there’s still a ton of pressure on drivers to get behind the wheel, no matter what’s ailing them. So it was a pretty big deal when Junior sought out the help of Dr. Mickey Collins and actually sat out of races during the 2012 season. It was only a few back then because his symptoms were relatively minor, but it was something of a learning experience for Dale. The concussion he suffers in 2016, then, seems like a whole world of difference. Junior is irritable, angry, prone to blow-ups. He can’t stand without losing balance or becoming nauseous. Headaches wrack his brain and make every moment miserable. And he’s so out of sorts that he feels like he’s distanced from his body and the events happening around him. He could barely even go out and get groceries, let alone get behind the wheel of a race car. Hence why he had to sit out the last half of the 2016 season. Driving would have been a hot mess. During the thick of the mess, Junior mentions that he started keeping a journal of his symptoms in the notes app on his phone. This is a man desperate to drive no matter what—which meant keeping track of symptoms, trying to find patterns, and evaluate the things that did or didn’t work in his recovery. He even starts describing how he feels in ways many of us can understand: in beer. On bad days, Dale would state that he felt like he’d drank “a couple of beers”. On days where he was in something of a funk but he could still function, it was more ½ or ¼ beer. This book is as authentic as it is informative—both about Junior’s career and about the actual concussion situation. If you were to compare this book to interviews he gave at the time, you wouldn’t find discrepancies, only an enlightenment of things left unsaid. And it’s incredibly candid about not only Junior’s experience with concussions, but about how they happen in sport. It gets you thinking about how many other drivers have been enduring similar symptoms that they’ve managed to suppress. Don’t let the whole “this is a book about concussions, not necessarily racing” statement get you out of sorts. It’s an incredibly fascinating look into the mind of one of motorsport’s most cherished racers and how his struggles with brain injuries have had an impact not only on his career but on his well-being. It’s a must-read for anyone who enjoys an injury-prone sport like racing. And that’s all we have for this month’s Jalopnik Race Car Book Club! Make sure you tune in again on January 5, 2018. We’re going to be reading Beyond the Limit by Professor Sid Watkins. And don’t forget to drop those hot takes (and recommendations) in the comments or at ewerth [at] jalopnik [dot] com!